Portal for public SaaS MQTT labs based on MIMIC MQTT Simulator for Samsung Artik . Shared, read-only lab with Bosch sensors publishing unique JSON messages with temperature telemetry to your Samsung Artik account as detailed below. Access it here . 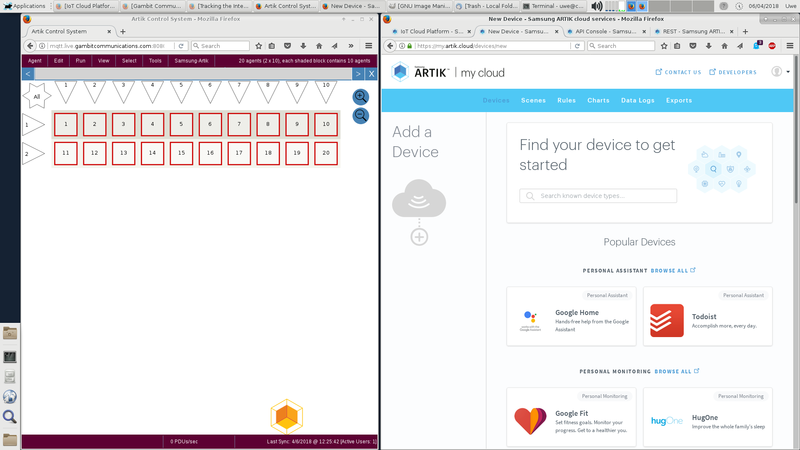 This lab demonstrates integration of Samsung Artik and MIMIC MQTT Simulator to produce an out-of-the-box lab for immediate (within a couple of minutes) first-time setup and use of a realistic IoT Control System as demonstrated in this Youtube video. The power of MIMIC is not limited to this. If you have a scenario you need simulated, send e-mail to sales@gambitcomm.com. This procedure is shown in this Youtube video. In the other browser window, in your empty Artik account, just navigate to your API console page and execute the first Get User Profile call by pressing on the call, then TRY IT!. If there is an error in the Response Body then you need to login to Artik, or refresh the window to get the latest Artik session parameters. Then invoke the Samsung-Artik menu in your lab, and click on Configure Artik - Live. from the Response Body copy the value of the "id" field, without the double quotes into the UserID field. Once you click Ok, a new Run Script Console tab is opened with the output of the processing. Once it says Task completed, your lab is configured to work with your Artik account. If you now reload the lab window, each icon should have a name underneath its number, eg. the first device should be named Actuator. To start using the lab, first see that the device instances are showing in your your Artik dashboard. You can chart the telemetry by clicking VIEW YOUR DATA. Add the first couple of devices, in this case Actuator, Bosch1 and Bosch10. When you start the corresponding devices in the lab, you will see the telemetry charted in real-time. In this lab, the temperature reported by the sensors increases while the Actuator device is turned off, and when they reach a threshold temperature, the Actuator is turned on, causing the temperatures to fall. You can verify the rules that control the devices in your rules page. Since these rules were added by the API console, you need to click on Show rules private to other applications. The bottom 2 rules control the devices. Now you can investigate further how things work and change things on the fly. To clear the lab, follow instructions of Q: What about privacy? in the next section. A: Running our pre-defined control system does not cost you anything. Q: What exactly does this do to my Artik account? and three new rules. for the control system. You can also revoke your authentication code in your active sessions page and in your API Console press REVOKE. And you should delete the 20 device instances in your device page. For each of them, click the ... menu and select Delete device.